I hope you all had an easy time finding covers. I did have another book in mind this week but decided to go with: Cross Her Heart by Sarah Pinborough – because I do love this author – in a totally non-bunny-boiler-not-a-stalker-way I hasten to add! I just love the colours for this and it has a certain simplicity. 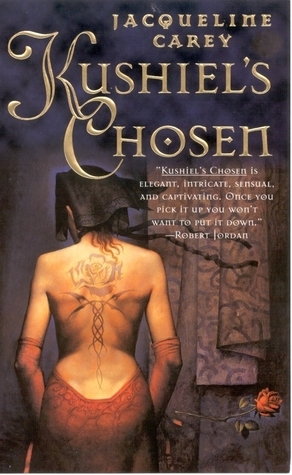 Last week was the first week of our readalong of Kushiel’s Chosen. I was away and so missed the post and am now catching up. Nancy from FaeStruck’s Reviews and More was the host. Below are the first week’s Q&As. Please be aware of spoilers. And, if you’re interested in joining the schedule is here: SCHEDULE. 1. The book opens with Phédre and her household happy and content at Montrève. Phédre is faced with the question of returning to the Service of Naamah. The sangoire cloak is the what pushes her decision. Do you agree with her choice? Do you believe that Phédre would have returned to her calling eventually, regardless of the cloak? I think her choice was inevitable really – it’s her nature. I do think that she needs the thrill of a chase though, it’s not simply about serving Naamah really, I don’t think she would just go back in order to gain patrons, I think she wants the mystery, the danger and the linking together of clues. 2. With Phédre returning to the Service of Naamah, Joscelin is also forced to make his choice as well. Who do you think had the harder decision to make and why? I think both decisions were difficult, I can see why Phedre is going down this route but I think it’s really tough on Joscelin. It’s just really not in his nature and I guess it must feel like a rejection in a way – like he’s not really satisfying Phedre? At the back of his mind he must be thinking that if she was happy with him she wouldn’t return to the danger? 3. Phédre’s return to court unveils how Queen Ysandre is faring in the absence of her husband Drustan. Politically, should she take a lover while he is away? No, I don’t think so. There’s something of a romantic element with these two and in a way, if either one of them took a lover I think it would spoil that element at the moment. Plus, I think given the differences they have to overcome, they need a stronger foundation between them before they start delving elsewhere. 4. Favrielle nó Eglantine designs Phédre’s Midwinter costume. How do you feel about the way in which Phédre repays her? This is very odd. I wasn’t expecting her to pay the marque but I thought it was an interesting gesture. I’m not sure what to make of Favrielle at this point. She seems very bitter and I can understand that to a certain extent but there’s something nagging in my mind, almost as if there’s something more about her. I guess time will tell. It will be interesting to see if she has any allegiance to Phedre now after her grand and rather unexpected gesture – it will be interesting to see if her sourness becomes less so in the face of such generosity. 5. Joscelin is spending quite a bit of time with the Yeshuites. Is it the pain of Phédre returning to Service that prompts this or would the Cassiline’s faith, pushed so far already, have led him there if Joscelin and Phédre were simply looking for the answer to breaking the geas on Hyacinthe? I don’t think he would have made this choice if Phedre hadn’t made hers. In some respects that may make him sound weak because it suggests he’s just reacting to Phedre’s choices. In a way though, I think that’s probably true – not that he’s weak, but he comes across a little as though he doesn’t really have his mind made up himself, or, perhaps that he doesn’t really believe his own feelings or convictions. I’m not describing it very well! Sorry. Week 2 to follow shortly.